Powerful and reliable, this high quality upright fridge is the ideal cabinet for the commercial kitchen. Large enough to accommodate 2/1 gastronorm pans, the fridge includes three robust removable shelves and a sturdy lockable self-closing door. The Polar refrigerator is constructed from sturdy stainless steel and features strong heavy duty castors, so it's easy to clean and manoeuvre, whilst the user friendly control panel and display ensures accurate and precise temperature regulation. 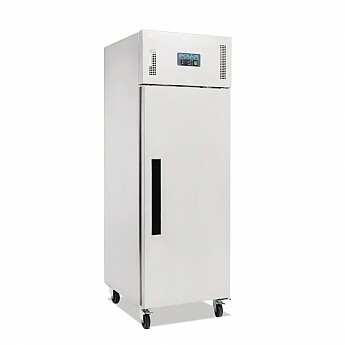 The perfect commercial fridge for restaurants, takeaways, schools, cafés, hotels and canteens.